We’re on the road, deep down in southern Indiana. The scenic byway twists and turns through rolling hills and limestone bluffs; Pine trees look like picks stuck into the terraced roadside, signs warn us of road slides. We snake back and forth, the Ohio River comes into view, at last, we have arrived at our destination, the historic rivertown, Madison Indiana. This is one of those places you’ve either been to or never heard of, it’s not a place most folks commonly know of, until today that is…. Nestled along the banks of the Ohio River, the city was platted in 1810, it consists of historic commercial and residential buildings, quaint streets, public parks and 133 blocks of the downtown area known as the Madison Historic Landmark District; picture wonderful characteristics of New Orleans, Savannah and Charleston brought together in one lovely little town. 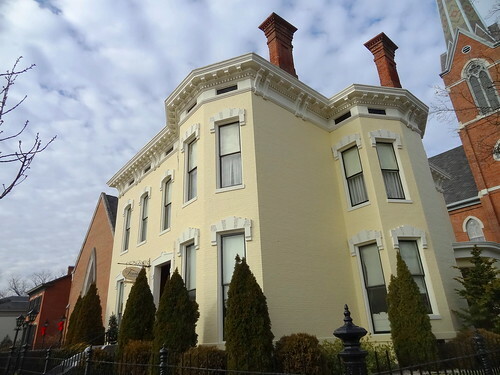 Madison’s early years were spent as a bustling steamboat town, heavy river traffic brought residents and wealth to the area, located between Cincinnati and Louisville on the mighty Ohio, industry, transportation and culture flourished, it was also a stop on the underground railroad. 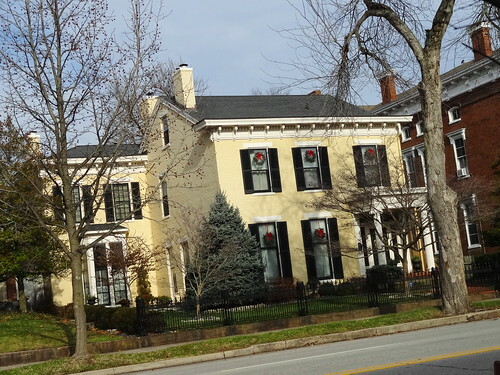 Federal style is the most common architectural style in the district with over 400 buildings represented, but there’s a little bit of everything. We begin the day with a tour of the Lanier House, a grand Greek Revival mansion designed by Francis Costigan and built in 1844. James F D Lanier was a businessman, banker and entrepreneur of such great wealth he actually loaned the state of Indiana money, saving it from bankruptcy TWICE! 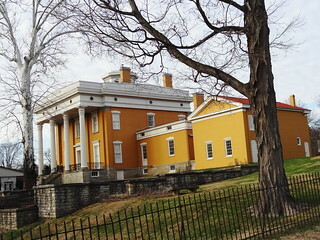 The home remained in the family until 1917, the State took control of the home and opened it publicly as a historic house museum, it became a National Historic Landmark in 1994. 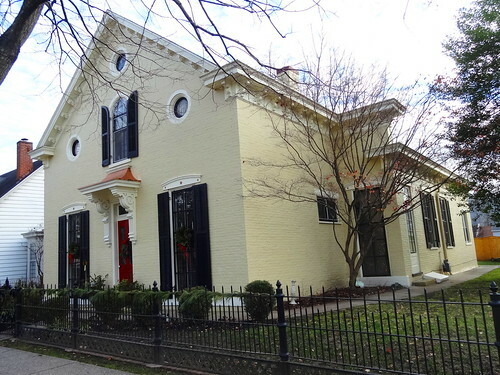 Let’s have a look….The exterior wears its original color of gold, Corinthian columns, Doric pilasters, dentilated cornice and ornamental pediments over doors and windows shout Greek Revival. 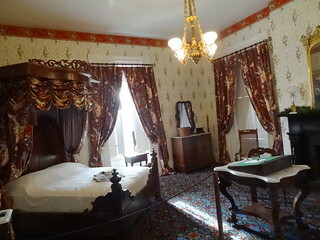 The interior has been restored to its former grandeur, original colors on walls and plaster moldings are covered in a high gloss varnish just like in 1844. 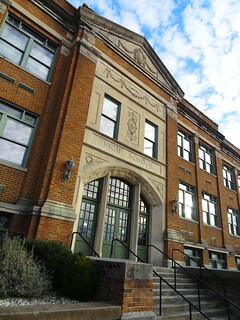 Standing in the hall, we notice there are two front doors, one facing the street, the other faces the river, from here we see just a tease of the circular stairway. 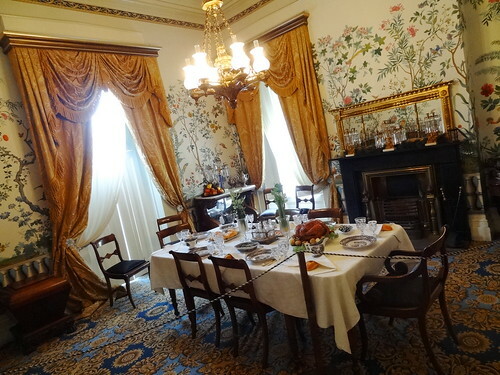 We start in the dining room, the table is set, it looks as if dinner is ready. Elegant glass lamps rest on the fireplace mantel, heavy drapes cover the windows, Oriental floral design wallpaper wraps the walls. Crossing the hall I take notice of the dentilated molding as we enter the parlor. 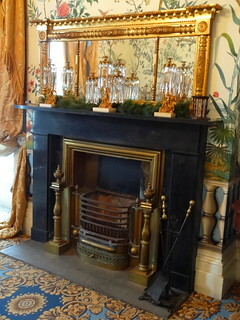 Wallcoverings and carpets are heavy with patterns, all are reproductions, above the fireplace hangs a very nice oval mirror; the room is decorated for the holidays, an old-fashioned Christmas tree stands near a window. The other side of the room features an antique piano with fancy carved legs, a harp sits nearby, this is where guests would be entertained. 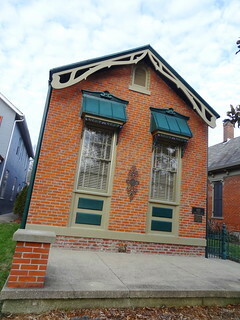 The family would gather in a less formal room, here the children would play with their toys or do homework at the desk. Gorgeous chandeliers hang in each room, beautiful pieces and glass lamps rest on tables and shelves. 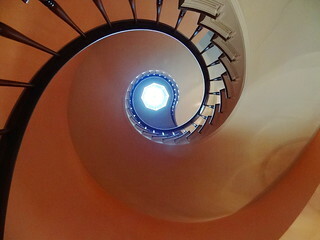 Before we ascend the stairs we take a good look at the circular stairway, it seems to hang in mid-air, standing at the bottom you can look straight up to the cupola, light fills the tunnel-like space. 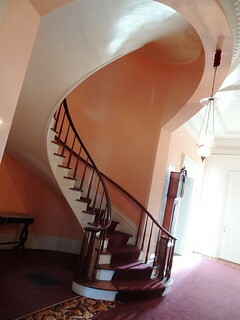 Funny, the last three historic homes we’ve visited each had a spiral staircase, I can’t remember a single one we’ve seen before that. Upstairs a thick wood bed fills the master bedroom, drapes, carpet and walls each wear a unique floral design, somehow it all works. River facing windows offer an unobstructed view of the formal gardens, I’d love to see them in the summertime. 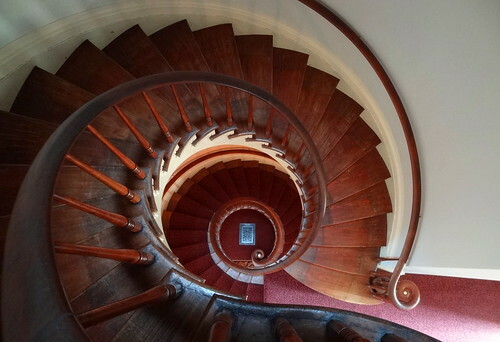 The spiral staircase continues up to the third floor, steps are bare wood, round windows are reminiscent of portholes and give a 360 degree view of the city. We thank our guide and hit the streets of Madison. One of the city’s most famous attractions is the Broadway Fountain, with good reason, it’s stunning. 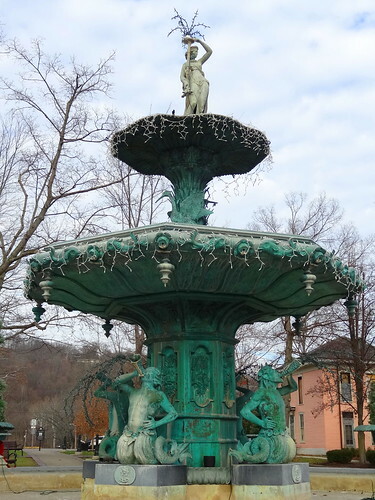 Designed by French sculptor J P Victor Andre and created by Janes, Kirtland and Company, the fountain was originally exhibited at the Philadelphia Centennial Exposition in 1876. The Independent Order of Odd Fellows (think Freemasons) purchased the fountain several years after the exposition closed and presented it to Madison in 1886. Originally cast in iron, time and the elements eventually took their toll, it was recast in bronze as a bicentennial celebration of the citizens of Madison, it should be safe for a very long time. I stand and look, taking in the details, created in the neo-classic design, the top basin features a robed maiden holding a rod, two large birds surround the second basin, the base is surrounded by four horn-blowing Tritons. Ornamental urns rest upon the top wall of the reflecting pool, today miniature lights dangle from the upper and lower basin. The fountain has that perfect patina, it’s ideally placed right off Main Street among larger homes, it’s the perfect setting for live music and festivals. 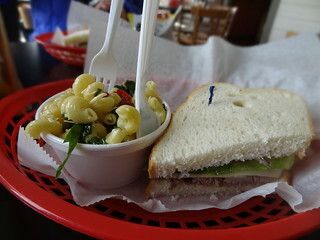 With so much to see we only have time for a quick lunch, The Red Pepper, will suit us just fine. We order the daily special at the counter and have a seat in the dining area, we’ve done a lot of walking, it feels good to relax. Our lunch arrives in minimal time, we’re having a roast beef sandwich slathered in horseradish mayo, topped with lettuce, tomato and red onion, tasty. Along with chips we ordered a side of pasta salad, it’s a nice combo of noodles, sun-dried tomatoes, fresh basil, chopped garlic and dressing, yum! 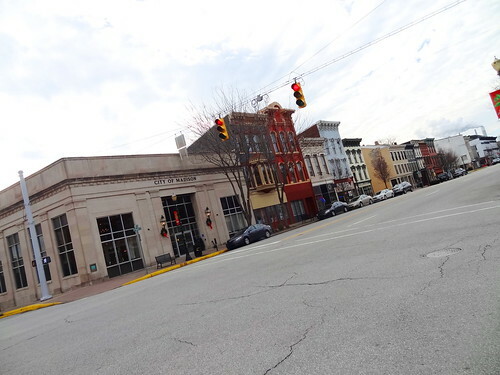 We leisurely stroll Main Street, it’s picturesque, quaint, old-fashioned, attractive. 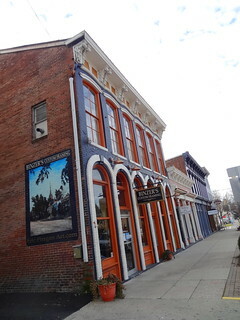 Narrow buildings of varying height line the street, window pediments, awnings and vintage signs decorate storefronts; church steeples pierce the skyline. Longtime businesses share the street with the new; the Ohio Theatre has been showing movies since 1938. 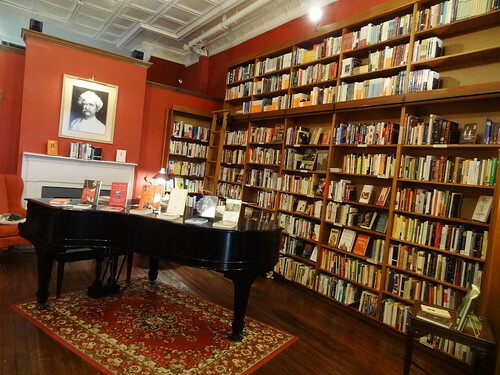 We stop in at Village Lights Bookstore, the Twain Room makes me want to get comfy in a chair and read, it is the ultimate in cozy. We browse through Something Simple, a home goods store, gift shops and best of all a chocolate shop called Cocoa Safari Chocolates, hands down the best dark chocolate, malted milk balls I’ve ever had! 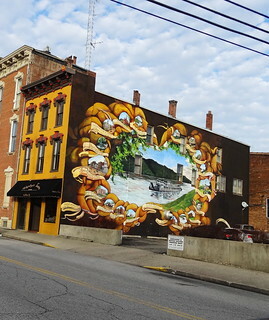 There’s a wonderful mural of a steamboat floating down the river on the side of Shipley’s Tavern on West Street. 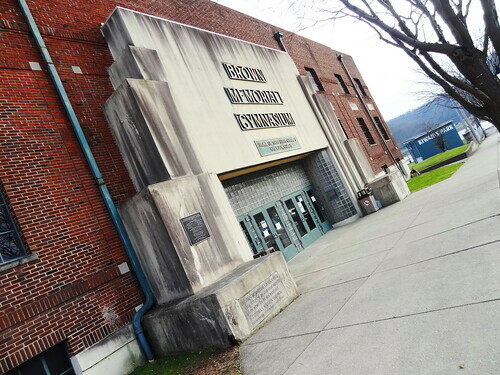 The Art Deco style Brown Memorial Gymnasium built in 1924 stands apart from the rest of the buildings. We spend the rest of our time here walking neighborhood streets, the homes and streetscapes are very different from back home in Detroit. 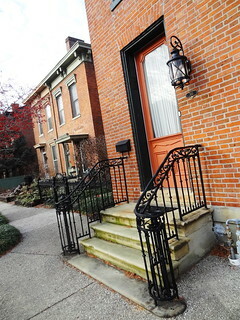 While the majority of houses are Federal style, they vary in size from tiny to sprawling; mainly constructed of brick, many owners choose to pain the exterior in a variety of colors, highlighting architectural details. 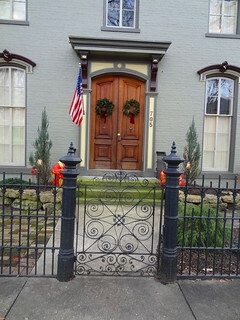 Iron fences with ornamental gates are the norm here, so pretty. 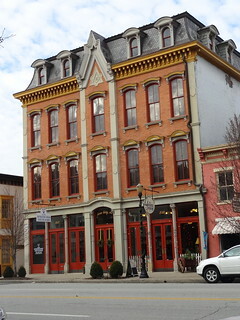 We cover Second Street, First Street and the riverfront; hotels, taverns and mills once lined the streets along with stables, slaughterhouses and a tobacco prizing house. Today this area is primarily residential, many of the homes have historic significance, a placard placed in front details the importance. Holiday decorations linger, wreaths and garlands are festive, doors and entryways are notable, porch lights and sconces are extraordinary. 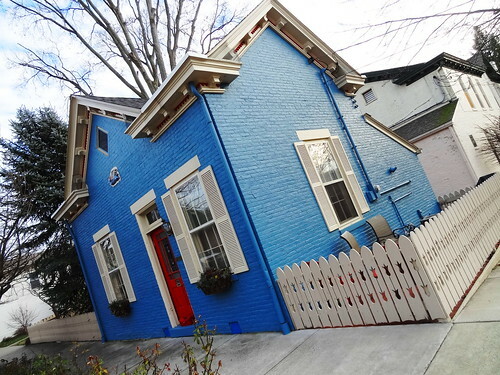 A surge of restoration is taking place throughout the neighborhood. 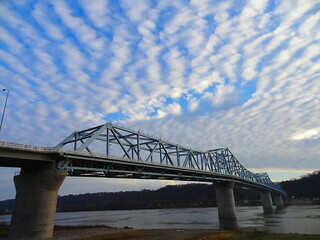 We linger on the riverbank, barge traffic is brisk this afternoon, up ahead a bridge leads from Indiana to Kentucky, in the sky clouds seem to be putting on a show, quickly changing formations, in spite of all the activity, the surface of the river is calm. Before leaving town we stop in at the Thomas Family Winery on Second Street. The old 1850’s stable and carriage house has been transformed into a pleasant tasting room complete with wood burning stove and board games. Sitting at the bar we enjoy the complimentary tasting of wines and old world ciders, we buy a few to take home and enjoy later. The sun is beginning to set, the sky and water enjoy a pinkish glow. Kris points the Jeep east toward Cincinnati where tomorrow our adventure will continue. Nice photos! Next time, stay longer as there is much more to see! 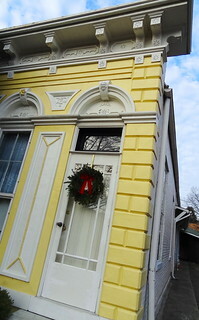 Something of note: The yellow house near the bottom of the picture display — if you were to tap it with your finger, you would learn that it is made of tin! But since I told you, you don’t have to trespass and try it for yourself! Come back soon. We’d love to have you back. And bring or send your friends! 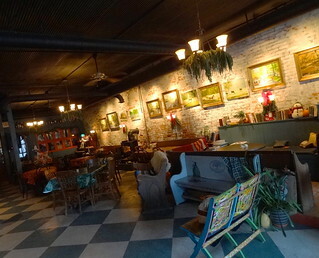 Nice Photos, Madison is my hometown was born there and spend a lot of time there while growing up. Lots of great memories! Ah, yes. The beauties of home ❤ Stay longer next time, and visit during Chautauqua in September! It's just amazing! My father and mother as well as my sisters and I were born in Madison, Indiana, I have walked every street, from one end of Madison to the end and back … not up the hill, but downtown part…..shown the city to my friends and family…….left when I was 19, and have lived in many states …loved Madison and love it more now than when I was growing up, am more mature now and see the beauty more than ever! People were so friendly and still are. I love to return to Madison and see where I grew up …a beautiful city with so many beautiful people. Madison Indiana is one of my favorite places to travel. 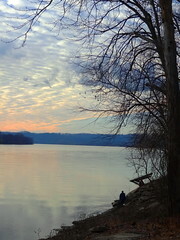 The surrounding areas along with Clifty Falls State Park, are awesome. You must travel there and stay a weekend or longer! Stop in the Visitor Center and you will receive a wealth of information about what the area has to offer. The people of Madison are very kind. A lot of history and beautiful nature. 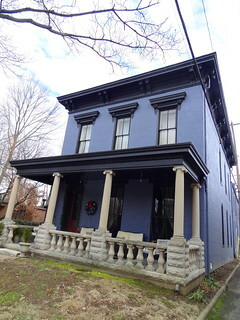 There are several places you can stay but my favorite is Bishop Hill Guest House. 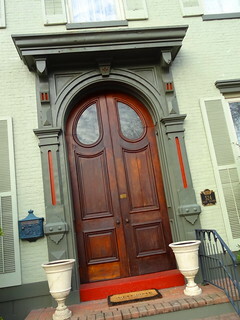 Have been to Madison several times, stayed at Clifty Inn, had a wonderful time. Lots to see and do and not a bad drive from Detroit! Thank you for taking me “back home again to Indiana.” I was born in Madison, but don’t get back as often as I’d like. I remember walking to the library when I was young and stopping for a rest at the fountain. most wonderful place I know. Grew up there. Sounds like fun! Thanks for the tips Marilyn. The article doesn’t mention the hydroplane races that are held in Madison. This is something that Madison has had in common with Detroit until this year! Detroiters should drive down to Madison for the 4th of July and see the races while they wait for the return big boats to the Detroit River. Madison has been our home for nearly 40 years. Southeast Indiana in unlike any other part of Indiana. Rolling hills and valleys, water falls and creek beds and country fields. 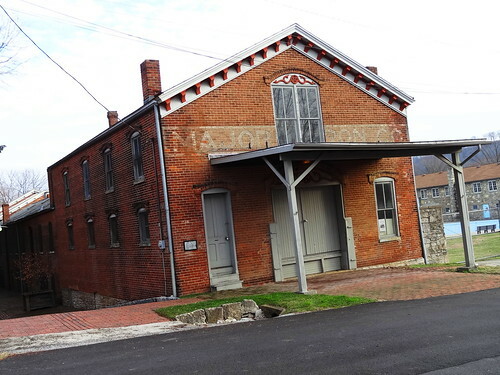 Madison is a wonderful historical River town locate on the Ohio River. Museums, concerts, restaurants, shopping, talented artist, architecture, wineries, state park and many festivals are a regular happening. 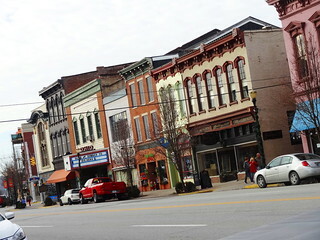 Hospitality overflows throughout Madison and Jefferson County, Indiana. We love our Madison!! My home town. Wonderful place to grow up in the sixties. Many childhood friends still live there. My parents owned a grocery store on west second st. Attended church at First Baptist. Many fond memories. Love to visit and see how the people of Madison have kept it nice. Became a bit of a ghost town in the seventies. So happy it has been brought back to a full beautiful small town! 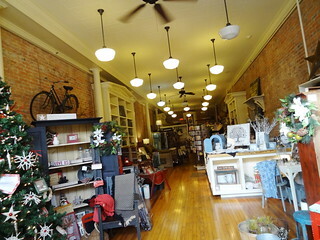 Yes, this is where my family and I have chosen to live I am so happy and proud to be featured here and hope many more will read, come and enjoy the magic of Madison, IN. We have lived here about 30 years. I sometimes miss my home state of Michigan but not enough to move back. Just making an occasional visit to Michigan keeps me on track for family, snow and etc. Hope everyone will take time to come visit and share what we have to offer. .
Love Madison. Living all of my fifty three years in the downtown historic district I have grown to understand what a special place we live in. 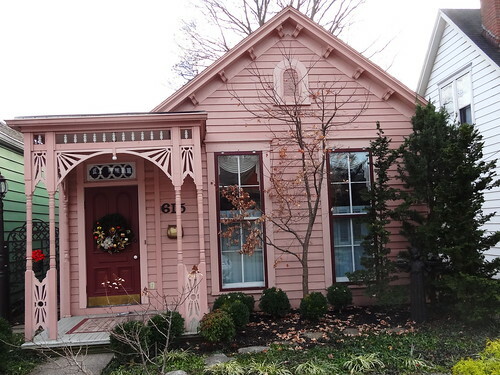 After starting my real estate career in 1999 and now a broker with F.C.Tucker/ScottLynchGroup I fully understand the excitement while showing properties to potential newcomers in the historic district and Madison in general. A must stop destination and with quick call to the Madison Visitors Center you can receive a full list of the upcoming years events.